Get the ultimate extended warranty for as little as USD $3 per month. Annual Upgrade - Get a brand new eAlarm every year at no additional cost! "Unbelievable Value"
Loss Protection - If you lose your eAlarm, we will replace it 100% for free with free shipping, no questions asked! Damage Protection - If you damage your eAlarm, we will replace it 100% for free with free shipping, no questions asked! 24/7 Trip Protection - If you take your eAlarm on any domestic or international trip it will be covered and replaced if damaged! Free Shipping Forever (with active plan) - Free Shipping on All BASU.COM Products! Awesome Discounts Forever (with active plan) - 20% off all BASU.COM Products at All Times! January 1, 2019 This product was great and warranty was legit. Customer service was impeccable. December 28, 2018 I always lose my things. ⭐⭐⭐⭐⭐ Really loud and easy. November 12, 2018 I like this option because I love renewing my alarm every year and can give the new one to my daughter. Is an eAlarm Choice plan required to use my B A S U products? No. Your eAlarm does not require this plan to function. eAlarm Choice simply offers additional warranties and benefits for those who want them. Is there a contract requirement? How often can I trade out my eAlarm? I have a basic eAlarm, which plan is best for me? 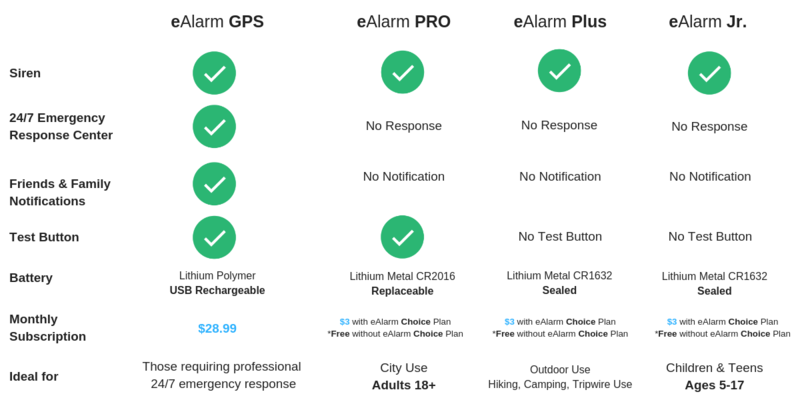 We recommend the eAlarm PRO plan which allows you to switch between any eAlarm model at any time (except eAlarm GPS). I have eAlarm products at more than one address. Does one eAlarm Choice plan cover them all? ​No. You'll need to subscribe to a plan for each additional product.